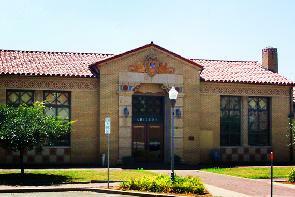 The Civic Center is located in the restored Union Pacific Railroad Depot in historic downtown Abilene. This 160-person space is ideal for wedding receptions, birthday parties, business meetings, reunions and more! A security deposit is required with each rental, written on a separate check that is refunded upon return of the key and an inspection to be sure that there are no damages to the building or special equipment. We ask that set-up and clean-up be included in the rental time frame. Tables and chairs are included in the rental fee.